Slashed .324/.374/.459 between High-A and Double-A in 2016. When Rosario was a teenager, he was a messy amalgam of limbs, athleticism and clearly present baseball instincts that were all wholly unsupported by a lack of physical strength. As he has started to fill out (it was easy to see, even back in 2012, that he was going to) and gotten stronger, he has become more explosive, his actions more refined, and he’s begun to hit. And indeed, at just 21 years old with more room for mass on the body, Amed Rosario has just begun. Rosario is so exceptionally athletic that he’s likely to be a plus defender at short even if he adds another 10-15 pounds into his 20s. His first-step quickness, range and ability to make strong throws from strange platforms are all excellent. He’s remarkably flexible for such a tall, gangly infielder and has a quick transfer allowing him to scoop tough hops and hose baserunners all in one motion. 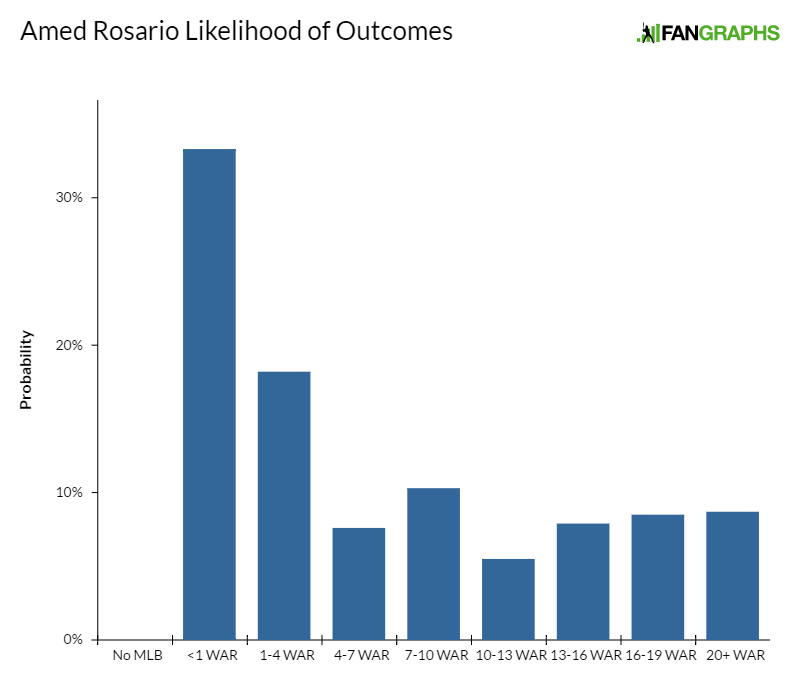 Rosario’s newfound offensive prowess is a substantial layer of icing piled onto a favorable and cakey defensive profile. He did not look out of place taking batting practice at the Futures Game among some of the best power-hitting prospects in baseball and planted a few shots of his own deep into the Petco Park bleachers. His swing has natural loft and he’s so flexible that his extension through contact often results in a 360-degree journey for his bat. There’s a chance he has plus raw power at maturity. How much of that power he’s able to utilize depends on some refinement to Rosario’s contact skills. There is some stiffness in his hands prior to their acceleration, and he pushes far too much weak contact the other way right now, but he has good bat control, plus-plus bat speed and a decent idea of what he’s doing at the plate. We’ve seen several different iterations of Rosario’s footwork in pro ball. At times there’s a big leg kick, others there’s not. Sometimes there’s a kick until he’s got two strikes. Despite these constant alterations, Rosario hits. He and the Mets are still clearly searching for something that they think works for him. When they do, I think we’re looking at a plus hitter with average game power and plus defense at short. This is my pick to appear No. 1 on my overall top-100 list next offseason barring some disaster that forces him onto the big-league roster for an extended period of time this year. Strikeout rate actually improved following promotion to majors. It’s fair to look upon Gsellman’s late-season big-league success with a suspicious eye, as five of his seven big-league starts came against either the Braves or Phillies. But his stuff took a clear step forward late last year, his fastball touching 97 and sitting 92-95 with intense bat-missing movement. Gsellman had long been a fastball/fastball command prospect without a good breaking ball and then, as seems to be a trend in Queens, he was suddenly able to conjure that extra velocity as well as an upper-80s slider. Gsellman will dial things down to hit his spots with the fastball, but when he’s ahead in the count and letting it rip, it’s a riding 95-plus mph fastball that plays as a 70 on the scouting scale. The slider, 85-91 mph, has inconsistent length but is usually at least average (and often above) because of how hard he throws it. Gsellman has retained his long standing, low- to mid-80s curveball that has more vertical depth than his slider (which often looks like a cutter) and is average. His changeup is often a hittable upper-80s bore that opposing hitters treat like a batting-practice heater when he misses with it up in the zone. But Gsellman’s command of his fastball (when he wants to command it) and his two breaking balls allow him to mitigate what might otherwise be moderate platoon issues, and he projects as a low-risk above-average big-league rotation piece. 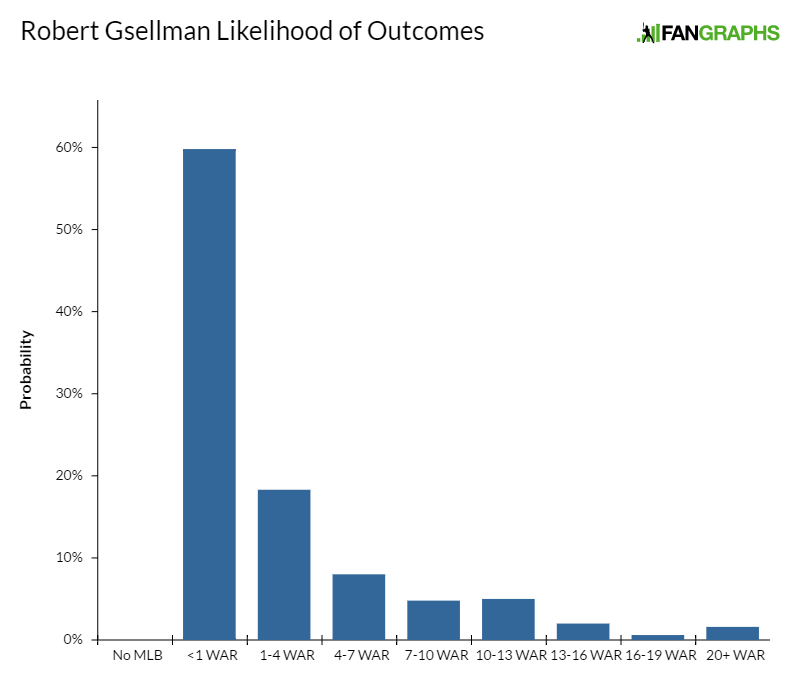 *As with other prospects, Gsellman’s KATOH+ projection does not include major-league numbers. Produced .155 ISO at Double-A. The rare hit-before-power first-base prospect, Smith only began to display on-paper power output last year once he had freed himself of pitcher-friendly parks and began to enjoy the friendlier confines of the Eastern League. He has above-average raw power, rather pedestrian for a first baseman, but has such a terrific feel to hit and proclivity for all-fields contact that he’s going to tap into most of it while making a lot of strong contact. His approach is church-mouse quiet with a smooth, well-timed transfer of his ample weight and absolutely zero extraneous noise in his hands. He lets balls travel deep in the zone before unloading on them and often that results in doubles down the line the opposite way. That said, he’s begun to pull the ball with more authority as he’s moved into the upper minors. There are scouts who do not like Smith at all. He often appears aloof, he can single-handedly disrupt the pace of games just because of how long it takes him to sashay from the on-deck circle to the batter’s box, and I’ve clocked Smith, full-effort, from home to first in the 4.9- to 5.0-second range. Smith’s physique has long been a contentious subject among scouts as well and, while he’s arrived at camp looking less rotund than in the past, his mobility remains limited. If he hits, and I think he’s going to, I couldn’t care less about any of that. Defensively, Smith’s range at first is poor, but he’s a sneaky athlete for his build, has an above-average arm and very soft hands. Because such a significant aspect of defense at first is scooping bad throws and fielding awkward hops, he projects as a plus defender at first. 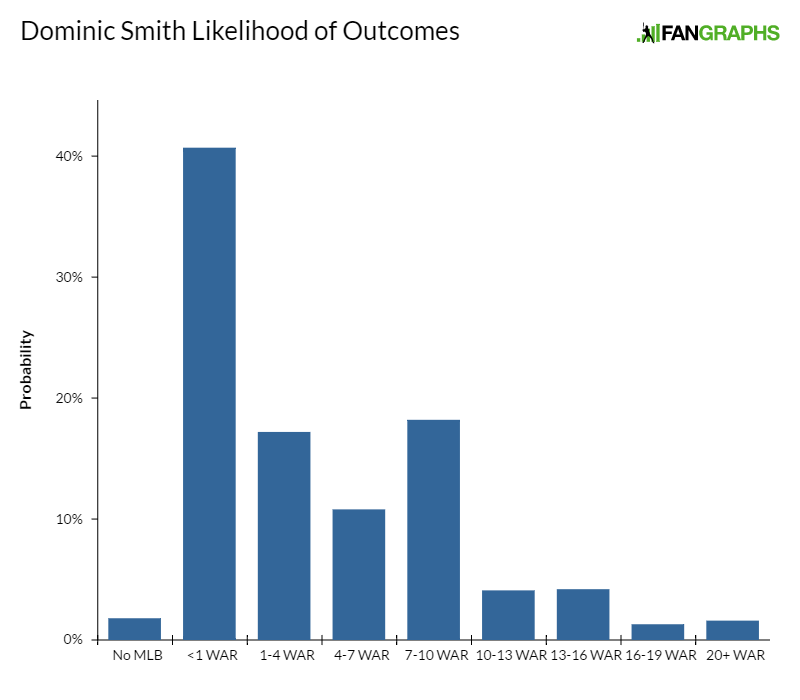 Smith isn’t on the 40 man yet, and it’s hard to piece together a scenario where he debuts this year outside of a slew of injuries to the Mets’ bevy of infielders. His modest raw power caps his ceiling, but he’s a high-probability everyday contributor for me. Recorded 72 strikeouts in 65 innings as junior at Boston College, 35 Ks in 30 pro innings after signing. It seems that every year a college arm moves from the bullpen to the rotation and looks so good that he forces his way into the top half of the first round. Last year it was Dunn, who began the season in Boston College’s bullpen before moving into the rotation in April. He made eight starts ahead of the draft and not only had success maintaining similar stuff to what he was showing out of the bullpen but viable starter’s strike-throwing ability, too. Stretching Dunn out allowed scouts to get a better look at a four-pitch mix headlined by a running fastball in the 91-95 mph range that will touch 96 and a potentially plus, mid-80s slider. Dunn also has a curveball and changeup, the latter of which has significant projection because of his terrific natural arm speed. It’s below average right now, but Dunn didn’t have many chances to work with it in his closer role at BC. It will be an essential aspect of his development. The curveball (just a slower, less tilting version of the slider) projects as a fringey change-of-pace breaking ball that Dunn can use to goof hitters for early-count strikes in later innings, when he needs to show them something they haven’t yet seen during that start. There are some concerned about Dunn’s relative lack of size. He’s thin-limbed and probably shorter than his listed height, but he has a sturdy trunk, uses his lower half well in his delivery, and his arm works just fine. I’m not any more concerned about his durability than I am about any other pitching prospect’s. Dunn has some moderate command issues that aren’t caused by any sort of inherent violence in his delivery and are instead a result of an inconsistent feel for his release point. The ease of Dunn’s delivery and his athleticism are indicative of improvement in this area, and he was also favorably young for a college draftee. He projects as an above-average big-league starter, provided his stuff holds up to the inning increase he experiences in pro ball. Gimenez got $1.2 million during the 2015 J2 period and, as a relatively advanced defender with atypical coordination for a teenager, he somewhat surprisingly went to the DSL in 2016. One club official with whom I spoke thought the Mets, who were likely to be buyers ahead of the trade deadline last year, wanted to hide Gimenez from stateside scouts in the increasingly evaluated GCL, but any org that saw Gimenez as an amateur already knows he’s good. His feel to hit is very advanced, he gets his weight into the baseball without overly noisy footwork, and his swing has natural loft that could produce some power as he matures. His early-career feel for the strike zone is encouraging, too, and he’s a potential plus hitter with fringe game power at shortstop. Gimenez is an above-average runner with a plus arm, giving him the necessary physical components to remain at short. At this age, that’s all that really matters. He also has good first-step quickness and instincts for the position, so even if he fills out quite a bit as he matures, he could still remain at short. There are those who think Gimenez, whose frame is more mature than the typical recent J2 signee, might eventually fill out and require a move either to second or third (you could put an Anthony Rendon comp on the body). If that’s the case, though, then he’s probably grown into more power than I currently have projected. The risk/proximity profile here is obviously high but it isn’t as lofty as the usual DSL prospect because of the polish, and the upside is a three-plus-win shortstop. None. Only played 32 games above complex level. A rocked-up physical specimen with plus straight-line speed and flashes of above-average game power, Lindsay fell to the second round of last year’s draft largely due to a nagging hamstring injury which shelved him for much of his senior spring. Those issues continued to plague him in 2016, and he was limited to just 32 games in affiliated ball due to hammy issues. It’s imperative that Lindsay, who played the infield in high school, get healthy and stay on the field so he can continue to get in-game reps in center field and polish up currently raw routes and decision-making. He has an average arm, so if he either slows down beyond the point of viability in center (either due to the constant lower-body injuries or physical growth), he probably moves to left field. Lindsay’s feel to hit is good, he has plus bat speed, and his swing is shorter than is typical for someone who loads their hands as high as he does. This does, however, prevent him from pulling the ball with authority consistently. He also, somewhat surprisingly, showed an advanced feel for the strike zone last year, though it makes sense to wait and see if he can do it over a much more statistically significant period of time before declaring him a strike-zone savant. His mature but impressive physique (he body comps more closely to Eric Weddle and Nate Allen than he does an obvious baseball peer) is relatively mature, so there isn’t much raw power projection left on the frame. Provided Lindsay can find a way to utilize what power he’s already got in actual games, the power/hit combination should profile anywhere in the outfield. That might come naturally with at-bats or require a mechanical adjustment. An above-average hit and power combination from a viable defensive center fielder is a potential All-Star, and I think that’s the ceiling for Lindsay, though his proximity to the majors and possibility that his injury issues (or just an inability to develop competence in center field) force a tumble down the defensive spectrum or impact his game in other ways, makes him inordinately risky. Posted 42% strikeout rate between Appy and New York-Penn Leagues. As pitchers with dominant breaking balls often do, Szapucki liquefied the Appalachian League and New York-Penn League last year. His curveball is already plus, breaking down beneath the bats of left- and right-handed hitters like an angry wave, and he backs it up with plus fastball velocity, usually in the 92-95 range but as high as 97. He has some nascent changeup feel but too often decelerates his arm to aim the change somewhere close to the strike zone. It’s imperative that Szapucki’s changeup develops, as his low arm slot will likely suppress his fastball’s effectiveness against right-handed hitters as he enters the upper levels. He’s shown some ability (intentional or otherwise) to manipulate his fastball’s movement, which could also help him deal with righties as he climbs. Scouts’ concerns are not simply limited to slot/platoon issues. Szapucki’s pitching track record is limited, especially for an arm that will be 21 for much of the 2017, and his 2016 season was abbreviated due to a late-summer back issue. Many of his 2016 starts came on extended rest, and scouts want to see him pitch every fifth day over the course of a full season before declaring him a no-doubt starting pitching prospect. 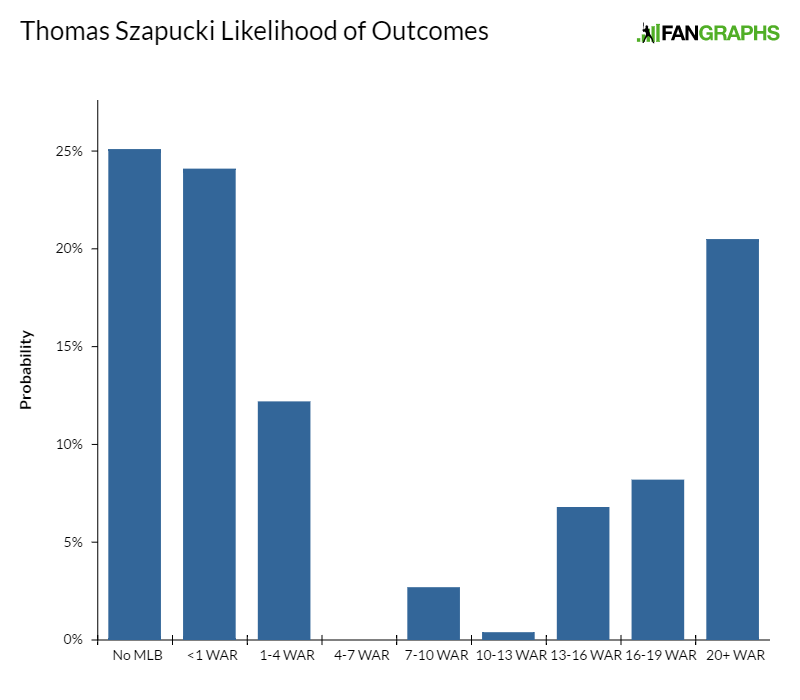 If he can, the upside is high, but there are several justifiable reasons to be skeptical of Szapucki’s ability to get there. Reduced strikeout rate from 26% in 2015 to 11% in 2016. Nido ironed out his offensive footwork in 2016, which helped improve his timing, and he machete’d his strikeout rate in half. He’s also toned down some of the high-effort components of his amateur swing. The combination of average but well-controlled bat speed has been effective. His swing has enough natural loft that he might be able to scoop out 8-12 homers annually with catcher at-bats. A catcher who puts the ball in play and produces even a little bit of power is a potential everyday player, even if his on-base ability is a bit limited by a swing-happy approach. 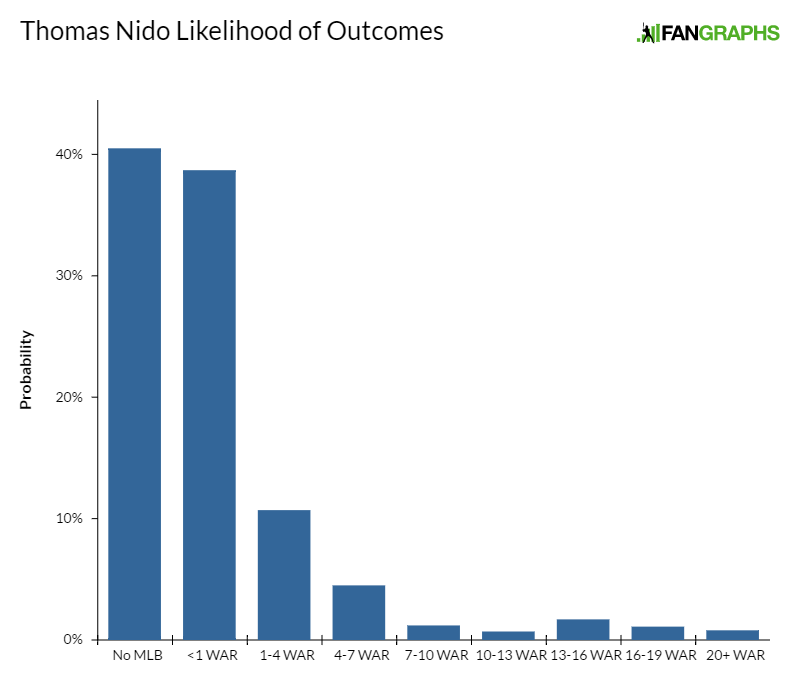 Nido is a solid receiver and ball-blocker with an above-average arm. In five years of pro ball, he hasn’t shown any signs of growing off the position, and he’s very likely to stay there long term. He lacks the impact tools typically required to profile as an impact regular, but his respectable collection of tools could allow him to become a fringe-average everyday catcher. Recorded .189 ISO at Triple-A Las Vegas. Nimmo’s diverse array of fringe to average tools has most scouts projecting him either as a platoon bat or luxurious fourth outfielder. An imposing physical presence, Nimmo is a fringe athlete with above-average speed that allows him to pass in center despite mediocre instincts there. He’s average in the corners. 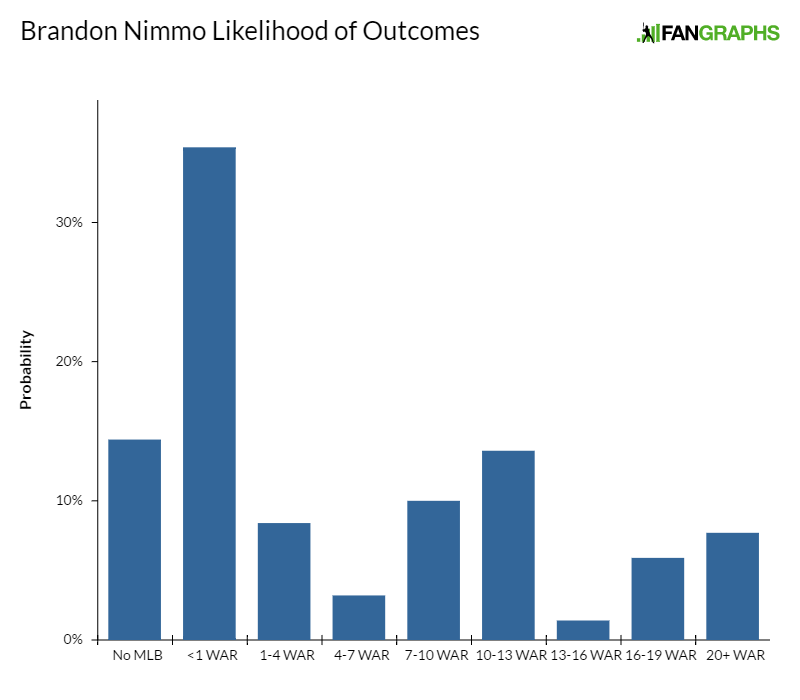 Scouts prefer Nimmo in left if pressed into everyday duty, as he lacks prototypical right-field arm strength. A minimalistic approach to hitting mitigates what might otherwise be swing-and-miss issues caused by Nimmo’s long levers, but it also makes it hard for him to make consistent airborne contact and tap into his average raw power. It’s more of an average hit, fringe-game-power profile, though Nimmo’s well-documented issues against left-handed pitching present opposing managers an obvious late-game solution. He’s a high-end makeup prospect who should have a long career in the majors, but unless you’re still willing to project on the skills because of Nimmo’s fairly unique background or think his admirable ability to take a walk pushes him into average-regular territory, he’s a rock solid 45. As Guerrero continues to grow into his frame, he’s going to start hitting for power in games. His swing has gentle but impactful natural loft that should allow him to hit for some power without sacrificing too much contact. Of course, as he slows down he might have to move off of short, but he’s an above-average athlete with decent actions and a plus arm, so there’s a chance he sticks there as a fringe defender. If he moves to second or third, though, he could be above average. His power/hit combination at either of those lesser positions would still be enough for everyday duty as an average regular. Recorded 10% walk rate, 11% strikeout rate at Triple-A. 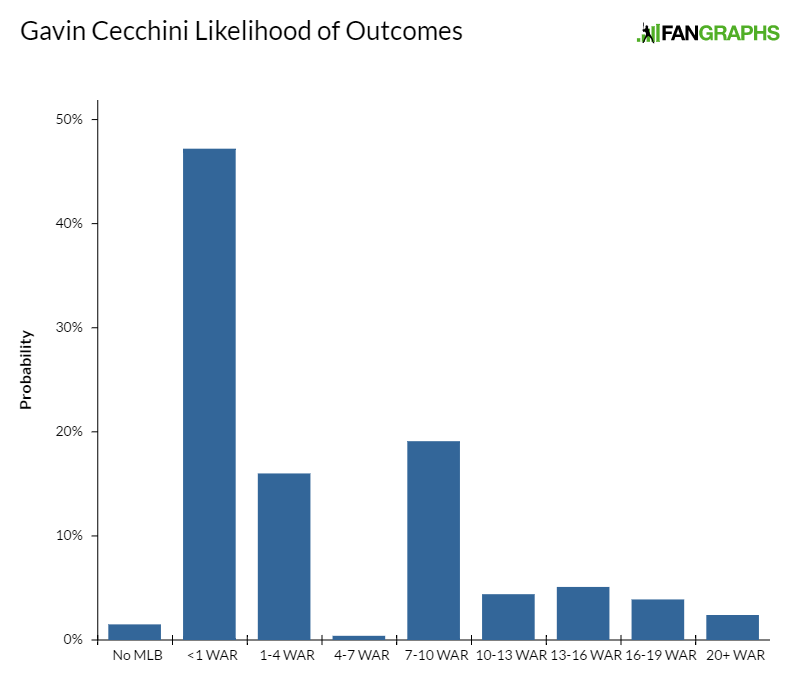 Cecchini’s swing is geared for ground balls, with either a very flat or often downward path that requires impeccable timing for him to make any meaningful contact. He has excellent hand-eye coordination and above-average bat speed (though it requires some effort) which, when coupled with this swing, has made Cecchini extremely difficult for even upper-level minor-league pitchers to strike out. He’s a future plus hitter if he isn’t one already. But Cecchini can’t play shortstop. He lacks the athleticism for the position, has fringey arm strength, alarming arm accuracy issues and there’s no guarantee that a move to second base (where he’s seen an increase in reps) will remedy any of that. His hit/power combination is unlikely to profile every day at second even if he does end up fitting there defensively. It’s encouraging that, despite the lack of power, he’s held his walk rate while ascending trough the upper minors, and I think maintaining his on-base ability is his most likely route to everyday duty. If things don’t work at second base, the entire profile falls apart. He’s either a low-end everyday player or nothing at all. Slashed .374/.469/.659 as junior at Florida. A pull-only hitter with prototypical raw power for first base, Alonso’s amateur career was mired by inconsistency and random injuries, including a broken left metacarpal caused by a Jordan Sheffield fastball in 2016. He was bad on the Cape as a rising senior, fueling concerns about whether his strength-over-bat-speed power would play in pro ball with wood. But as a junior, despite returning from his broken hand before it was totally healed, Alonso hit and hit for power. Now the question is whether a right-handed-hitting first baseman with potential swing-and-miss issues can tap into enough of his considerable raw thump to profile at first in the majors. His hands are a bit noisy and his pull-heavy approach to hitting, which leaves him rather vulnerable to offspeed stuff away, could be exploited at upper levels. Moreover, there’s very little track record for right-handed throwing and batting, first-base-only college bats having MLB success aside from freaky unicorn Paul Goldschmidt and Eric Karros’ hair. Had .393 slugging percentage in 2016 before shoulder surgery. Becerra has added 35 pounds since he signed, and his power output had been trending upward in lockstep with his maturing frame until 2016. While I’ve gotten inconsistent reports on Becerra’s bat speed in the past, the chief cause for the outage is generally viewed as a torn right labrum through which Becerra played for the first half of the year before he had surgery and was shut down for the remainder of it. It was above average during BP pre-injury. He’ll need it to return when he does this year, as this is a corner-only defensive profile. 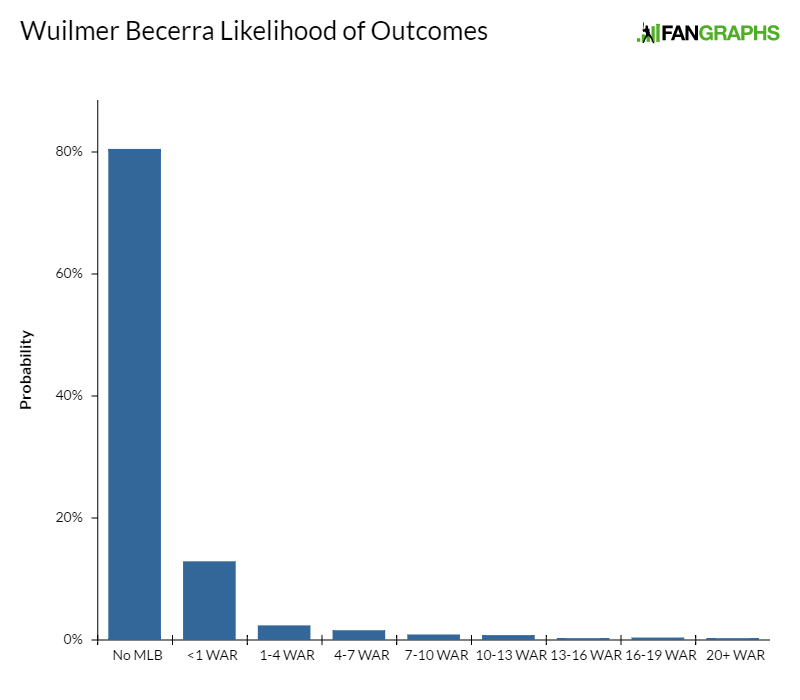 While I’m skeptical of Becerra’s power potential even independent of the shoulder injury, he does hit. He has excellent bat control and hand-eye coordination as well as a natural feel for all-fields contact. He suffers a bit from Josh Vitters Disease, his natural ability to barrel everything actually working against him, and his lack of selectivity may suppress his ability to reach base at the upper levels of the minors. He’s a plus hitter all the way though and should be fine defensively in either corner-outfield spot, provided the labrum surgery doesn’t have a negative impact on his arm strength, which has been plus. That’s not a slam-dunk everyday profile. If he starts showing the power again, we can talk, though we might have to wait for him to exit the Florida State League before we start seeing it. Recorded average fastball velocity of 95.4 mph during big-league stint. 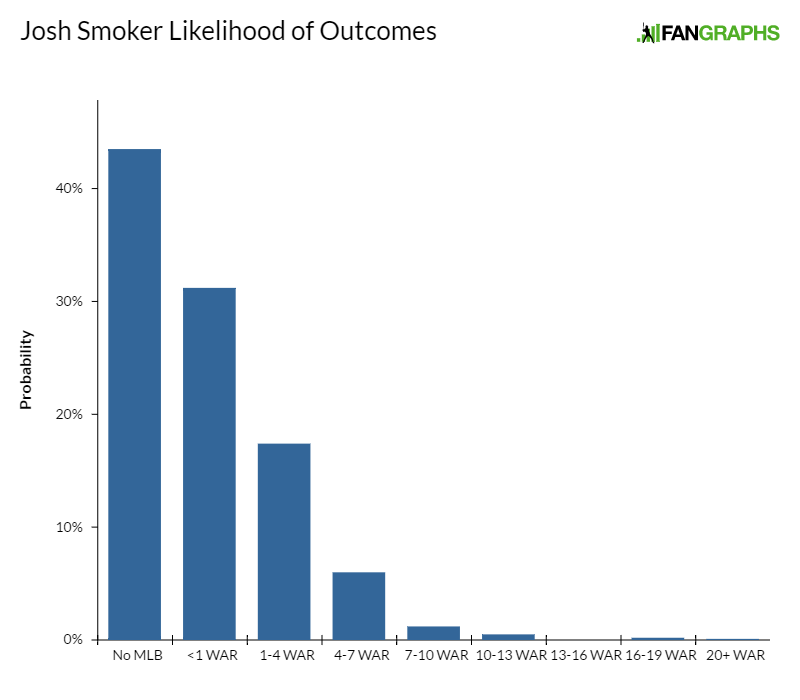 Smoker was out of organized baseball altogether in 2013 and 2014 after multiple shoulder surgeries derailed his career. His velo started climbing in 2014 before the Mets signed him. It has continued to do so since then, as well. He sits 94-97 with his fastball and has an above-average, low-80s slider and average splitter. The velo and combination of secondaries fits in a set-up role, though the injury resume dilutes what would otherwise be a fairly rare 45 FV grade on a reliever. Average range, an above-average arm, nimble defensive footwork and lightning-quick hands comprise yet another plus defensive profile in this system. Guillorme is a very good defensive shortstop whose foray into second base in 2016 was not an indictment on his glove, just early preparation for a likely future utility role. 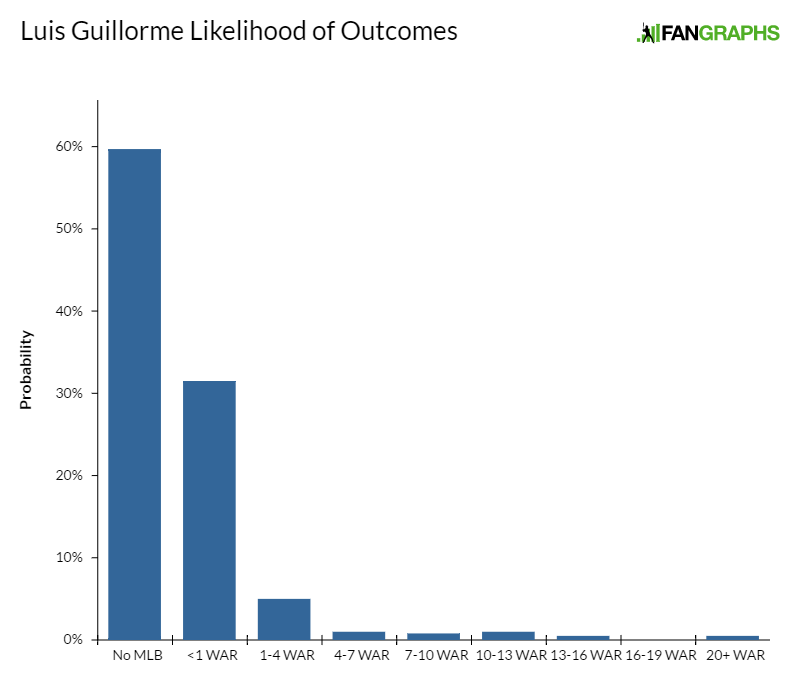 Even as a likely plus defender at short, Guillorme’s hit/power combination is unlikely to yield everyday value. It’s not for a lack of physicality: Guillorme is actually quite stocky. It’s just, his swing is just short and geared for low-impact, opposite-field contact in games. But he has fringe raw power in BP, and if he finds a way to pull the ball more he might get to some of it. Unless an adjustment is made on that end he projects as a 50 hitter with virtually no game power, which is why most scouts consider him a utility type rather than a regular, despite the glove. Recorded strikeout and walk rates of 24% and 9%, respectively, in NYPL. Gonzalez has a quick arm and an arm action so short it looks similar to the way a lot of converted catchers throw. It adds some deception to his low-90s fastball that has a little bit of plane. On occasion, Gonzalez can reach back for a poorly located 94-plus. His fastball command is poor, and he doesn’t consistently get on top of a curveball that flashes average and projects there. The changeup has projection because of the arm speed, and there’s a No. 4/5 starter’s repertoire in here if Gonzalez can develop average command. If not, he’s probably a useful middle-relief piece, provided his fastball ticks up a bit out of the ‘pen. None. Was recovering from TJ. Molina was rehabbing from Tommy John all throughout the 2016 regular season and picked up a few innings of work in the Arizona Fall League. I’m inclined to project him in the bullpen because of the injury history and violent delivery, but his repertoire depth and strike-throwing ability would otherwise fit in a rotation. He was up to 96 for me in the AFL, sitting 92-94 with a five-pitch mix. There was an average cutter in the 88-90 mph range; a clearly different slider down around 83-84 with nasty, late movement; and a below-average, upper-70s curveball on which I dropped some 30s due to its ineffective loop. He also has an upper-80s changeup that doesn’t move very much but is a viable change of pace to due Molina’s deceptive arm speed. The slider, a firm 60, is the star of the show, a pitch that I believe will miss bats in a big-league bullpen. He’s a potential setup man or potential multi-inning bridge, but the delivery terrifies me. Hit .322 in Appy League as 18-year-old. Even at the lowest levels of the minor leagues, Cespedes has been very young relative to his level and played all of last year as an 18-year-old in the Appalachian League. He raked there as he began to grow into modest but viable physicality. Cespedes has loose, whippy wrists, above-average bat speed and a pull-heavy approach. He’s an above-average runner who has spent most of his time in center field as a pro, but he’ll likely age into a corner (probably right field); if he does, we’ll need to see more power. As alluded to above, Cespedes has some physical projection but not so much that he projects to hit for prototypical right-field power. As such, he’ll need to continue to make an exceptional level of contact to profile. None. Played just 20 games due to injury. The narrowly built Carpio has an interesting bat-first offensive profile that’s intriguing at shortstop but not really viable anywhere else. He had just enough range, actions and arm strength for short, and if a 2016 labrum surgery (which forced him to miss the entire year save for a few of the season’s final weeks, during which he DH’d) sapped away any of the arm, then he’s probably going to have to move. There’s very little power here and the body doesn’t lend itself to much projection. There were scouts who considered Carpio a future utility man before the injury, which simply makes it a more likely outcome. Recorded 80 strikeouts in 65 innings at Triple-A. The rubber-armed Sewald “got” to play in his hometown of Las Vegas last year and the results were encouraging. 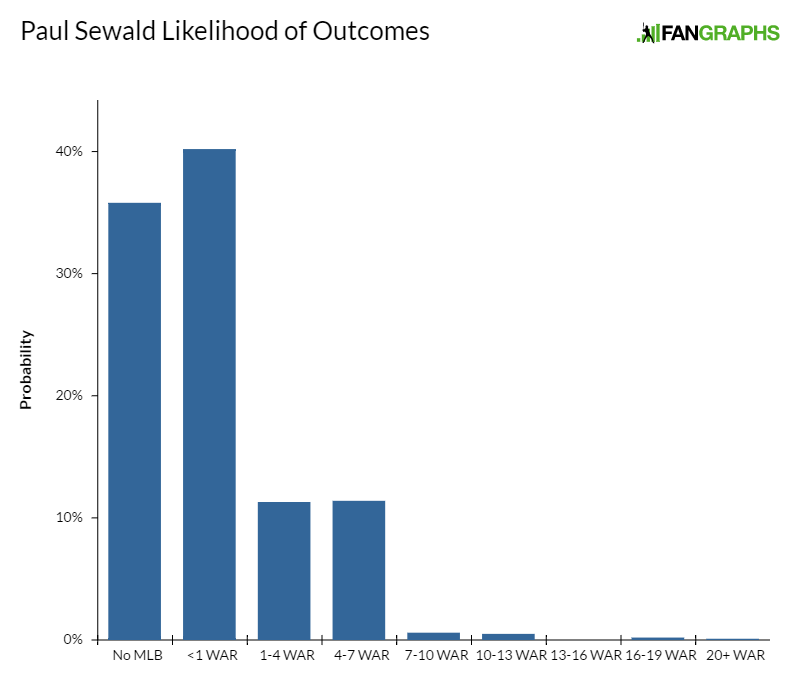 Sewald’s funky, low-slot delivery allows his 89-92 mph running fastball to play up against righties, same as it does for his above-average slider. He pitched in Mexico over the winter, prioritizing changeup development, and didn’t walk a single hitter over 19 innings of work as Hermosillo’s closer. He has a future a righty specialist, though if either the changeup or pinpoint slider command arrive, then he’s more than that. If both do, he’s a late-blooming fifth or sixth starter. At age 26, it’s clear which scenario is most likely. Anthony Kay, LHP — Kay was drafted by the Mets out of high school but chose to attend UConn. His late-season usage was troubling. Kay tossed a complete game against Memphis in the AAC tournament’s opening round. He then returned on three days’ rest in the title game against Houston and threw another 90 pitches, with an hour-long lightning intermission thrown in for good measure. He had Tommy John in the fall. Healthy Kay is a hyper-competitive little bulldog lefty who sits 89-93 and touches 95 with a plus-flashing changeup and fringey curveball. He was a potential No. 4/5 starter ahead of the injury, but he won’t see his first pro action until 2018, when he’ll have already turned 23. T.J. Rivera, INF, 0.7 KATOH+ WAR – Rivera has a simplistic approach to hitting that allows him to make a lot of solid, line-drive contact. He’s a below-average runner but is fundamentally sound at several infield positions and can pass as a 40 defender at second or short even though his range belongs at third base. He’s a low-end utility man for me based on the bat. Edinson Valdez, RF – Physically, Valdez is what big, 20-plus-home-run hitters look like at age 18, with long wiry limbs and broad shoulders. He should have at least plus raw power at maturity, as well as arm strength. Of course, corner-only profiles have very little margin for error, and Valdez hasn’t played an organized game in the states yet. It’s a high-risk, traditional right-field profile. Ali Sanchez, C – An excellent defensive catching prospect despite a fringe arm, Sanchez was aggressively sent to the NYPL as a 19-year-old and struggled to hit. But there are some bat-to-ball traits here, and he might hit an empty .250 while playing plus defense at peak. That’s a backup profile provided he finds a way to deal with baserunners a bit better than he does right now. Harol Gonzalez, RHP, 2.0 KATOH+ – An undersized righty who carved up the NYPL last year at age 21, Gonzalez is a pitchability righty whose velo ticked down as 2016 wore on. He can touch 94 but mostly sits 88-92 with an average cutter, deceptive changeup and fringey breaking ball. He commands the fastball and changeup. There’s back-end-rotation stuff here if the command maxes out. From a pure entertainment perspective, Gonzalez’s hair, competitive charisma and underdog build make him one of the more entertaining prospects in this system. Chris Flexen, RHP, 1.1 KATOH+ – The 2016 season was Flexen’s first full one after Tommy John, and he threw a strong 134 innings over 25 starts. He sits 91-94, touching 96, with an average curveball and fringe change. He has a big, sturdy, inning-eating frame but has already had a surgery, and there are scouts who’d like to see if the fastball plays consistently at 96 out of the ‘pen . Others think he’s more of an up-and-down starter. Andrew Church, RHP, 1.2 KATOH+ – Church’s average command of a lively 88-93 mph fastball and fringey secondaries was enough for him to coast through nine Low-A starts, but he stopped missing bats as he moved up late in the summer and likely profiles as an up-and-down arm. Anthony Dirocie, CF – A plus runner with an above-average arm, Dirocie displayed promising ball/strike recognition in the GCL last year but has swing-and-miss issues. He’s tracking like a fourth outfielder but might be more than that if he can cut down on the Ks without sacrificing his respectable game power. Champ Stuart, CF, 0.2 KATOH+ – An 80 runner with a multi-sport background, Stuart’s feel to hit has long been too raw to assume he has a big-league future despite his ability to competently play center field. I thought he showed improvement throughout the duration of last year’s Fall League (he tracked pitches more consistently, improved his bat control a bit, and simply adjusted to the intensity of the level), and I think he’ll put the ball in play frequently enough to earn a spot as a bench outfielder. He turned 24 in October, and even those willing to project liberally on his skills based on his background (born in the Bahamas, three sports in high school, small college) acknowledge it’s getting late in the game to hope for more than a pinch-runner/defensive replacement. That’s a solid outcome for a sixth rounder. Daison Acosta, RHP – A lanky and projectable Dominican righty with a long, overhand delivery, Acosta has been up to 93 and could add velocity as he matures. He has some curveball feel, too. He’ll be part of the GCL rotation in 2017. Colby Woodmansee, SS, 0.1 KATOH+ – Woodmansee’s smooth defensive actions and plus arm had him firmly in the mix for the top three rounds of the 2016 heading into the spring, but a down year at the plate and consistent 40-grade running times suppressed scouts’ enthusiasm. His swing looks grooved, and a rough pro debut in the New York-Penn League exacerbated concerns about swing-and-miss issues that plagued him as a junior at Arizona State. If he stays passable at short as he matures, then he could be a power-over-hit utility man (he has average raw pop), but that’s probably his only path to playing time unless he discovers better barrel control. Michel Otanez, RHP – Otanez had Tommy John in the fall but was 94-96 just before he broke. He’ll be a 20-year-old in the GCL when he comes back in 2018. If the velo return, he merits a look. Raul Beracierta, OF – An explosive power/speed prospect who is wholly unrefined, Beracierta was surprisingly competent in center field last year and might hang there for longer than initially expected. He needs a lot of game speed reps in Rookie ball before he’ll even be ready for an affiliate. Nabil Crismatt, RHP, 2.0 KATOH+ – Crsmatt will touch 95 with an average curveball and change and started throwing more strikes last year. He lacks the swing-and-miss secondary to confidently project him in middle relief. Jhoan Urena, 1B, 0.6 KATOH+ – Urena began to see reps at first base last year. Scouts view that as his likely long-term home, as he’s a below-average athlete. He has some raw power, but Urena has several slow-twitch, slider bat speed, Quad-A-hitter traits, too. Selected by Carson Cistulli from any player who received less than a 40 FV. Thompson is perhaps most well known for his junior season at Miami in 2015. Of the 143 batters in the ACC who recorded at least 100 plate appearances that year, Thompson produced the eighth-lowest strikeout rate (9.2%) and second-highest isolated-slugging figure (.312). That combination of contact and power is rare. At the major-league level, for example, only three players this millennium have produced a strikeout rate below 10% and ISO above .300 in the same season: Barry Bonds, Todd Helton, and Albert Pujols. No one has met both criteria in a single campaign since 2009. That mixture of contact and power tends also to be predictive of future success. Thompson hasn’t replicated the sort of numbers he produced at Miami, but his skills haven’t entirely eroded, either. Moreover, Thompson seems to have turned lemons into lemonade wherein his defense is concerned. Despite entering professional ball with only a medicore defensive reputation, Thompson was worth +10 runs at third over 50 games at short-season Brooklyn in 2015 according to Clay Davenport’s fielding metrics. Last year, Thompson produced +12 runs defensively in 45 games at Low-A Columbia per Davenport’s methodology. With an average bat and average third-base glove, he’d profile as a solid-average regular. That profile appears to be within his reach. This crop of talent is about average in terms of depth compared to the orgs we’ve reviewed so far, but quite sneakily has five top-100 candidates up top, including one of the best prospects in baseball. It’s an underrated lot, overshadowed within the city and division by superior systems. The lifeblood of the Mets farm is their Latin American program, which has yielded not only one of the most exciting prospects in baseball but a steady stream of talent throughout the entirety of the system. Two obvious trends stand out to me when examining New York’s recent history of player development and talent acquisition. The first is obviously the club’s ability to develop pitching. The second is what appears to be a clear preference for hitters with bat-to-ball skills. Every team likes guys who can hit, but other than Peter Alonso, each of the position players on the list are hit-before-power prospects. The Mets pick 20th in June’s draft and should add another 45/50 FV player to this list with that selection. We hoped you liked reading Top 20 Prospects: New York Mets by Eric Longenhagen! Eric Longenhagen is from Catasauqua, PA and currently lives in Tempe, AZ. He spent four years working for the Phillies Triple-A affiliate, two with Baseball Info Solutions and two contributing to prospect coverage at ESPN.com. Previous work can also be found at Sports On Earth, CrashburnAlley and Prospect Insider.